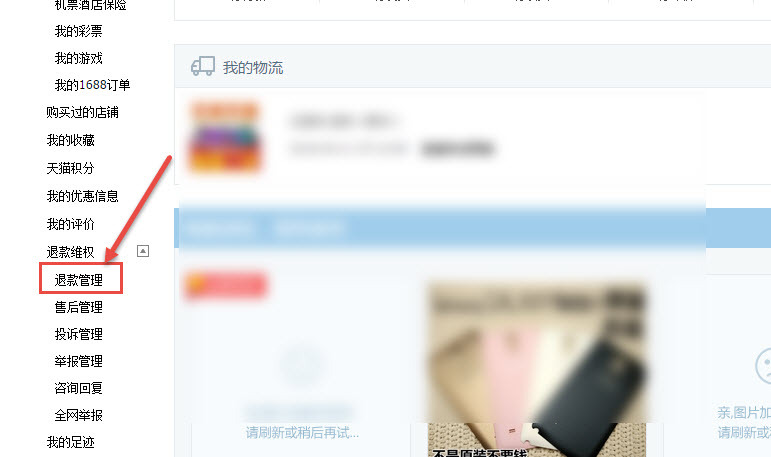 This post shows you how to request for a refund at Taobao. If you have purchased a wrong item or no longer wish to have it, you may request for a refund through the following details. If this option is available, it means that the seller has not received the fund. The status of the order is “payment has been made” and “goods have been shipped.” You may immediately request for a refund. Refund only: no item is to be returned to the seller, click: Refund only(仅退款). Application condition: If there is a problem with the goods, or if you no longer want the goods and have reached a compromise with the seller for a return, please select the “Return and refund” option. Return procedures: 1. Request for a return. >2. The seller sends a return address to the buyer. >3. The buyer returns the goods and fills out the details of the shipment. >4. The seller receives the goods, refund completed successfully. Fill out form: after clicking “return and refund”, you will see the above page. Two fields are required(* means required): Reason for return/refund(退货退款原因) and refund amount(退款金额). The seller sent the wrong item(卖家发错货). Scratched or broken upon arrival(收到商品时有划痕或破损). You may choose one that is closest to your situation. Field 2: Refund amount: use the default refund amount. 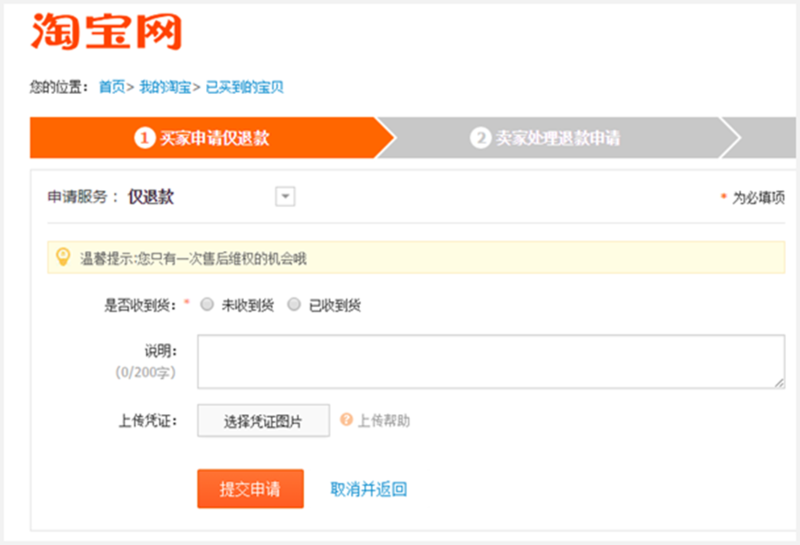 After filling out the form, just click “Submit application(提交申请)”. Application condition: If you have not received the goods, or if you have received the goods but have reached a compromise with the seller for a refund without returning the goods, please select the “Refund only” option. Return procedures: 1. Request for a refund. >2. The seller accepts your application. >3. Refund completed successfully. On this page, you will need to fill out this form. Field 1. Have you received the goods(是否收到货): not received(未收到货) or already received(已收到货). Ordered too much / wrongly ordered / no longer want it(多拍/拍错/不想要). Goods were not shipped on time(未按约定时间发货). No tracking record of the shipment(快递无跟踪记录). Note: You can only claim a refund via “After-sales applications” within 15 days from the time payment has been released to the seller.After 15 days, you will need deal with the seller via aliwangwang. 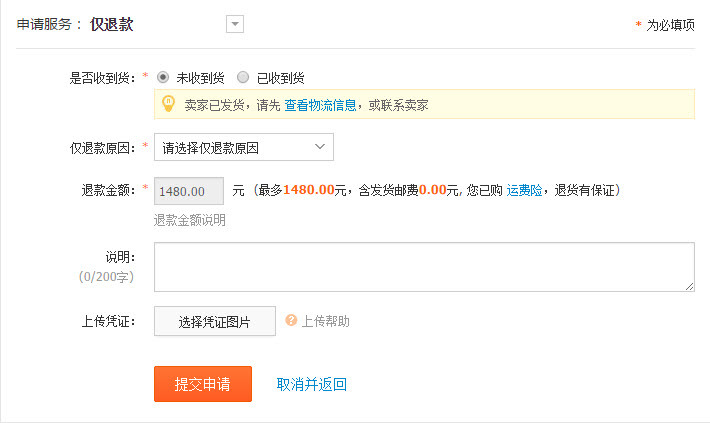 The buyer may enter “My Taobao >> Manage Refund(退款管理)” and find the refund amount at “My refund applications”. Click “check” to enter the refund details page, where you can check the time reminder. If the seller does not respond to your request within 5 days, the system will automatically approve your application by default. If you have selected to “return and refund”, then you will need to return the goods. Whereas if there is no returning of goods needed, you will receive the amount of refund as stated in your application. Hi, ordered through taobao for the first time more than a month ago. I should have known better. I received only one of 4 items and the seller claims its not his responsibility but of the warehouse. The warehouse says I should have made the claim within 48 hours. Within 48 hours of what? Not receiving the item? In my case it’s obvious they made a mistake (intentional?) as they send only one package where the items wouldn’t have fit. Lesson learned, don’t touch what you don’t fully understand, due to language barrier. But there was some delivery error So, The parcel back to origin. So, I asksed to shoper But they told me that you ask to delivery company not me. I can not find information of delivery company. Hi Eric, for refund, will it Be possible for seller to refund back into our credit card? If not, back to alipay? If I don’t have alipay, how should I go about doing it? 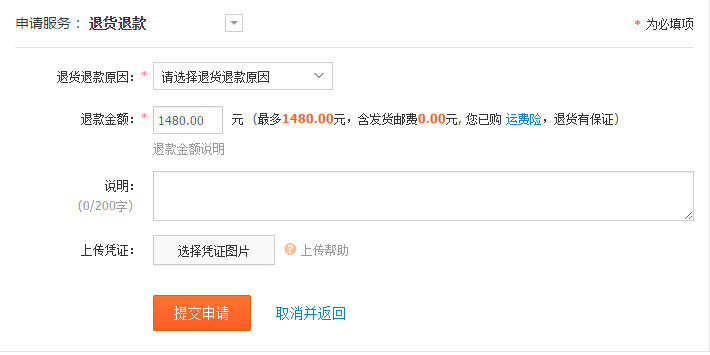 I placed an order on Taobao FOCUS, but the cost of shipping to the USA is almost as much as the merchandise. They don’t tell you how much the international shipping will be when you place the order. You only find out the cost later when the merchandise arrives at their warehouse and they ask for 2nd payment. I asked if they will ship by regular China Post (much cheaper) instead of Air Mail, but they won’t do it. The merchandise has already arrived at Taobao, but I am not sure I want it now due to the high cost of Air Mail shipping. Can I get a full refund at this point if I cancel my order? I might still go ahead and complete the purchase if they will give me a better shipping rate. What suggestions do you have? i have received the goods , but it is not in order. The seller agreed to refund. The seller say I will have to bear the shipping cost for sending back to good. you can try to sfexpress shipping from SG to China. Hi Eric, I just put up a refund request. Seller sent wrong item but refuse to refund full amount if I do not return the item. I do not want to return the item as it will cost more. Should I just wait 5days for the auto refund or should I contact a TB rep now? Seller has not reject the refund request I applied. you should contact return the item,if you don’t return the item,you will not get the refund. I placed order a few items on July 1 2017 and one item has yet to reached the warehouse. I have click on remind the seller to ship. I found out that the link to this item is not available anymore. https://world.taobao.com/item/547467865514.htm?spm=a312a.7700714.0.0.TUsulQ#detail . Can I get a refund? Can I add another order to my current order while waiting for the refund? How to tell them to ship the items if I do not want to wait? Do I need to wait since I have remind the seller to ship? How long is the warehouse going to wait for the last item. Very confuse. Thank you. yes,you can canel your order and get a refund.you need to contact them via livechat.